On April 15, 1945, British forces liberated Bergen-Belsen. The British found around sixty thousand prisoners in the camp, most of them seriously ill. Thousands of corpses lay unburied on the camp grounds. Between May 1943 and April 15, 1945, between 36,400 and 37,600 prisoners died in Bergen-Belsen. More than 13,000 former prisoners, too ill to recover, died after liberation. 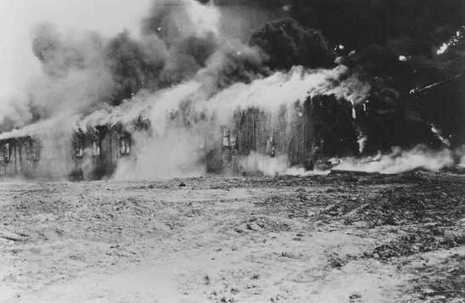 After evacuating Bergen-Belsen, British forces burned down the whole camp to prevent the spread of typhus. When the British and Canadians advanced on Bergen-Belsen in 1945, the German army negotiated a truce and exclusion zone around the camp to prevent the spread of typhus. Under the agreement, Hungarian and regular German troops guarding the camp returned to German lines when Allied troops liberated the camp on April 15, 1945. Although many SS guards had fled the camp, a small number remained, wearing white armbands as a sign of surrender. As a final act of defiance, the retreating Germans sabotaged the water supply to the barracks, making it hard for the Allied troops to treat the ill prisoners. 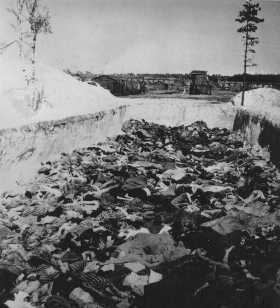 When British and Canadian troops finally entered they found thousands of bodies unburied and approximately 55,000 inmates, most acutely sick and starving. 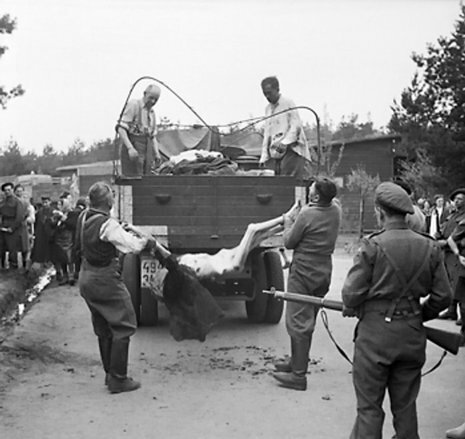 Over the next days the surviving prisoners were deloused and moved to a nearby German Panzer army camp, which became the Bergen-Belsen DP camp. The remaining SS personnel were then forced by armed Allied troops to bury the bodies in pits. Bergen-Belsen concentration camp was then burned to the ground by flamethrowers mounted on Bren carriers because of the typhus epidemic and louse infestation. The name Belsen after this time refer to events at the Bergen-Belsen DP camp. In spite of massive efforts to help the survivors, about another 9,000 died in April, and by the end of June 1945 another 4,000 had died (after liberation a total of 13,994 people died). On the 13th day after liberation, the Luftwaffe bombed one of the hospitals in the DP camp, injuring and killing several patient and Red Cross workers. The total number of deaths at Bergen-Belsen from 1943 to June 1945 was about 50,000. * Bully beef from Army rations. Most of the prisoners' digestive systems were in too weak a state from long-term starvation to handle such food. * Skimmed milk. The result was a bit better, but still far from acceptable. * Bengal Famine Mixture. This is a rice-and-sugar-based mixture which had achieved good results after the Bengal famine of 1943, but it proved less suitable to Europeans than to Bengalis because of the differences in the food to which they were accustomed. Adding the common ingredient paprika to the mixture made it more palatable to these Europeans and recovery started.